Are you concerned that taking over-the-counter-medication to help ease the pain from your stiff sore joints may have negative effects on your health? Then you'll be pleased to know that herbal tea is in fact one of the best remedies for stiff joints. Now you can sip your stiff joints into a state of relaxation and healing with the all-natural goodness that only nature can provide! Meadowsweet contains salicylic acid, the active component in Aspirin, and is therefore a mild but effective anti-inflammatory. This lovely herb also helps take the edge off while your body heals. Chamomile isn’t just for inducing sleep and calming your nerves. This apple-tasting herb also helps relax and tone your muscles so they can rest and rejuvenate. Alert: Can you completely erase arthritis pain in as little as 30 days? Hyssop is renowned for its super healing properties – but it works well for joints and muscles, too. A tea made from this delightful herb can help fight inflammation around your joints and in your muscles while staving off aches and pains. Marshmallow root has been used by people in various countries for centuries. When it comes to joint and muscle pain caused by intense workouts, this is the herb to work with! Sage is the ideal herb for using after your joints are feeling achy because you’ve slept wrong, are feeling tense and strained or have done brave exercise. It works by relaxing muscle fibres throughout your whole body. 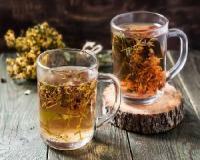 You can use one or a combination of the above herbs in a tea to soothe your stiff joints.